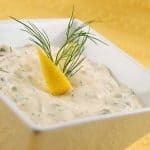 Whip up a homemade tartar sauce with fresh lemon juice, capers, chopped dill pickles and fresh dill to accompany simple fish and seafood entrees. Combine all of the ingredients in a small bowl. Cover and refrigerate for at least a 1/2 hour before serving to allow the flavors to blend.